John Haysom and Michael Bowen provide middle and high school science teachers with more than 100 student activities to help the students develop their understanding of scientific concepts. The powerful Predict, Observe, Explain (POE) strategy, field-tested by hundreds of teachers, is designed to foster student inquiry and challenge existing conceptions that students bring to the classroom. The POE strategy allows students to reflect on their experiences with and understanding of a subject before making a prediction about the outcome of an experiment and discussing the prediction with classmates. Following up this discussion with observations and then scientific explanations of the outcome gives students a more in-depth understanding of the subject at hand. Furthermore, the authors’ POE strategy helps teachers gain insight into students’ thinking throughout the learning process. Practicing the POE strategy also serves preservice teachers who need to develop strong pedagogy as they attempt to engage students in science learning and understanding. The 15 chapters cover topics such as force and motion, temperature and heat, light, chemical change, and life processes in plants. Lessons include worksheets, scientific explanations of the concepts being studied, summaries of student responses during the field tests, synopses of research findings, and lists of necessary materials. 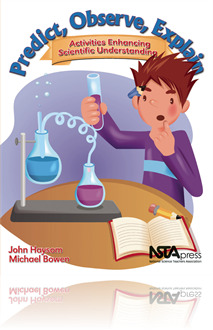 In Predict, Observe, Explain, Haysom and Bowen make it easy for novice and experienced teachers alike to incorporate a teaching method that helps students understand—and even enjoy—science and learning. This is an awesome resource for letting students take more control of their learning, the strategy is easy to use and can be adapted for practically any age group!